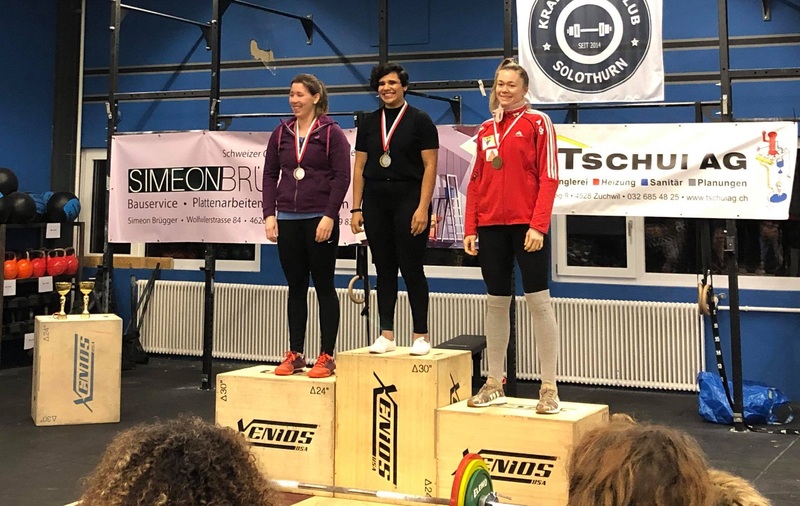 Four athletes from CrossFit GVA participated at the Swiss Powerlifting Championship 2019 (SDFPF) in Zuchwil SO on Saturday 9 February. Together, Alicia Hatt, Colin Mathers, Jerry Crossan, and Andrea Biswas walked away with new competition PRs and three gold medals and one silver. Andrea won her category and also got second place overall for women. In total, the team broke or established 8 new Swiss records. Colin alone, the most senior lifter in the competition, took to the floor to establish 4 new Swiss records (one in each lift plus the total). Andrea and Alicia got more than enough points to qualify for the 2019 World Championships in October in Germany. The SDFPF, the Swiss Drug-free powerlifting federation, was established back in 2000 as an extension of the “head federation“ WDFPF. It is drug-free alternative providing a fair competition platform in Switzerland. If you want to test your squat, bench and deadlift, the next SDFPF competition is on 16 March at CrossFit Basel. This meet will be a Single Lift Competition, meaning you can choose to compete in one, two, or all three lifts, but get ranked separately. You can find out more by following “SDFPF – Swiss Drug-Free Powerlifting Federation” on Facebook. We know a lot of you will be finishing up the fourth week of the Crossfit Open, so March may not be the best time to do additional lifts. However, there are always opportunities for team GVA to show its strength! Ask Ewen or Andrea if you want to know more about when the next competitions are taking place. Speaking of strength, we want to remind you that the 2019 Swiss Strong(wo)man season is just around the corner! The first competition of the year will be on 4 May at Crossfit Basel. The events are open to everyone and have a “scaled” category for those new to the sport. Join us the Strength Athletics class on Mondays at 7 pm to learn more or to train some unique skills with Coach Ewen.